Saturday afternoon 30 City Community Center hosted a Harvest Party to unveil the outdoor mural created by artist Gharan Burton. The painted display covers a large expanse of wall in the alleyway behind the North Country Food Co-Op. Outdoor Art: Plattsburgh Public Art Project sponsored the mural's creation. A master plan is set in motion to revitalize the alleyway area for outdoor dining. 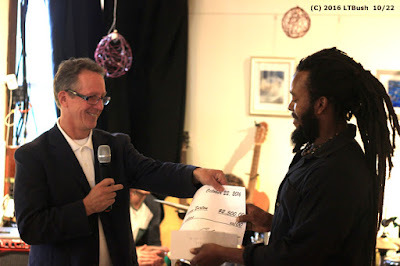 During the Harvest Party Colin Read (left) gave a special award to Gharan Burton in appreciation for his work. Time to find some hidden treasure. You never know what you might discover. My geocaching guide plans to spend the afternoon driving around, uncovering new treasure. 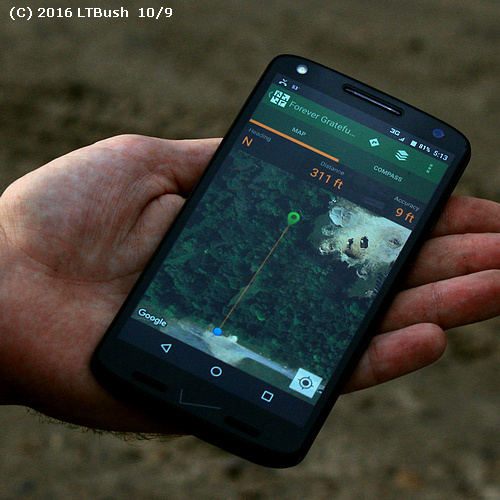 He's ready with GPS coordinates from online and his smartphone to aid him in zeroing in on each location. 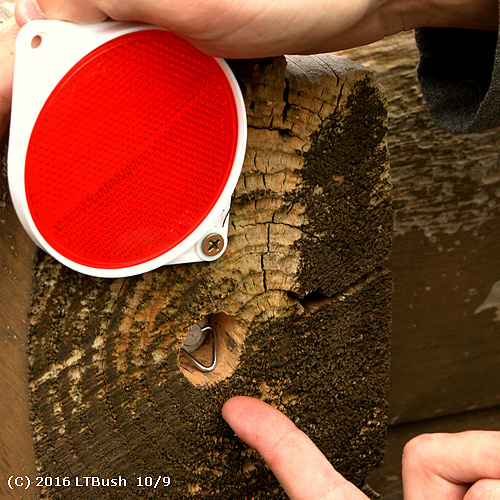 A geocacher can be either a placer -- someone who hides treasure -- or a locator -- someone searching out the treasure. A locator being in the general area of the treasure is only the first part. 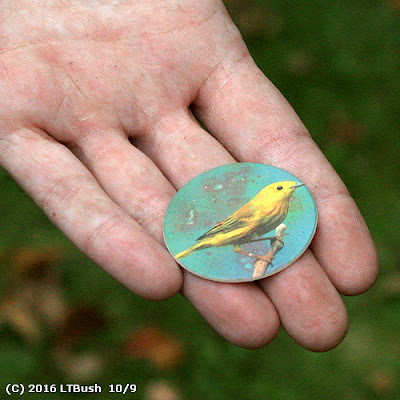 Geocachers place each treasure so that it's hard to find by searchers. 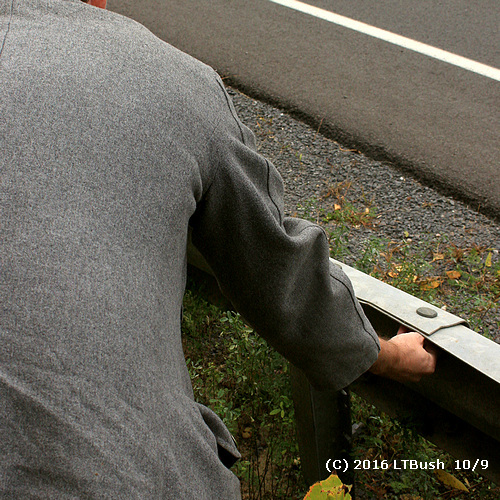 The containers may be hidden inside a tree or pipe or maybe even hidden under a guard rail out in the countryside. Geocache containers come in a variety of sizes and shapes. Sometimes the container is hidden in plain view. In one spot there's a few bolts embedded in a wooden post. But one of them is not real. 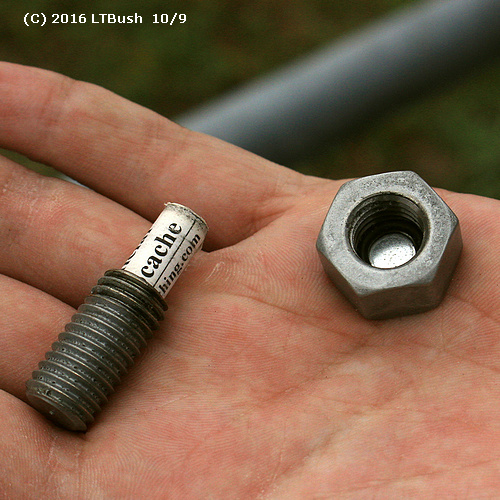 My guide pops out the pseudo-bolt, unscrews the container to retrieve the list inside of others who have been there before. 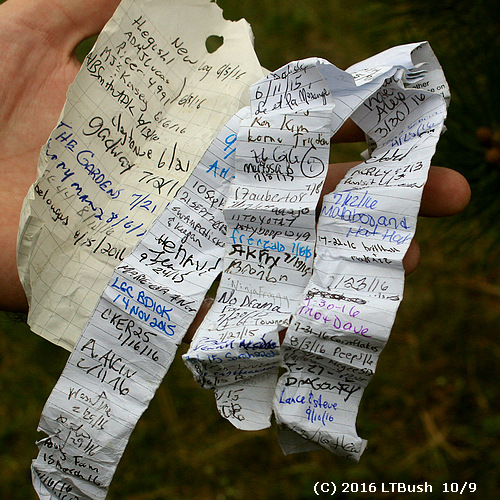 He unrolls the list and my guide adds his name to previous geocaching sleuths. Then he returns the list to inside the pseudo-bolt, caps it, and puts it back in the posthole. After seeing how the game is played I manage to spot another hiding spot, this one concealed behind a red traffic reflector. My guide tells me that before a container is placed on private property permission is needed from the land owner. Sometimes there is some trouble when a geocacher doesn't follow the rules of the game, cutting across private property to get to a public area where the cache is located. Online information tells if permission has been granted. 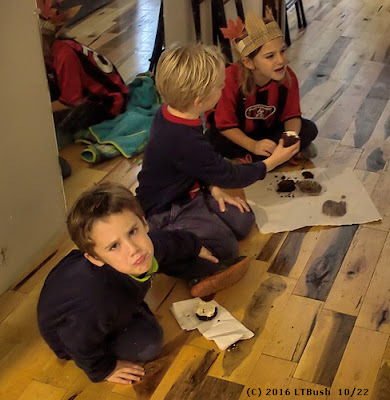 A container might hold little items for younger participants. 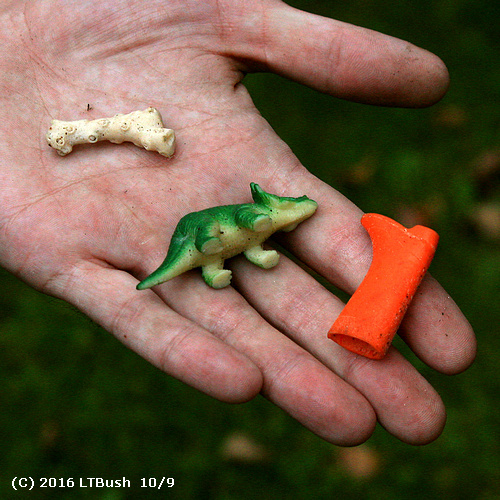 One cache contained tiny plastic toys and even an old cardboard pog. A searcher can find a Geocache Buddy or travel bug, a metal tag that travels from cache to cache. The tag comes in a variety of shapes and themes like a dog tag, ghost or animal. My guide carries a travel bug shaped like a turtle, a cartoon turtle depicted on one side. 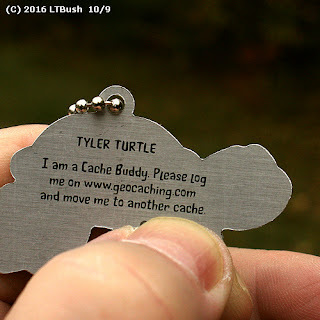 Flip “Tyler Turtle” over and stamped directions explain the Cache Buddy's purpose. The geocacher is told to log online to www.geocaching.com and log the tag’s individual tracking number before relocating it to another cache. This is like a game within a game, tracking a tag’s travels online. 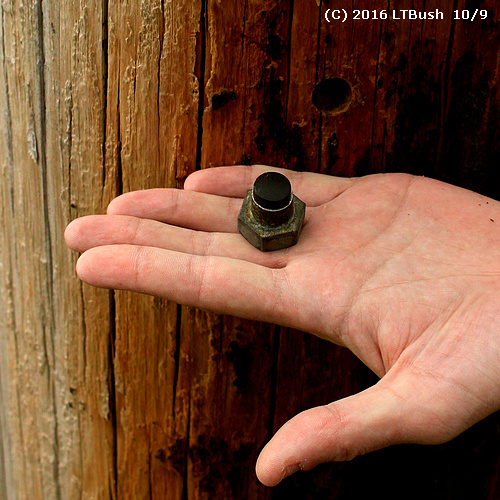 How active is geocaching in Clinton County? Some signature lists are long when revealed, crammed with names and dates. Looks busy to me. So if that guy you notice repeatedly searching in one spot it's not necessarily someone who lost his car keys. He could be on the hunt for hidden treasure. While the PlattInfo kiosks around Plattsburgh are supposed to offer information to tourists their screens remain blank. Due to the agreement made to secure funds for the kiosks the units have to remain in place -- despite being dead -- for a specified time period. Actually one of the kiosks isn't completely dead. The one on City Hall Place near Macdonough Monument is humming, apparently drawing power. You can distinctly hear the humming when standing behind the kiosk. A small energy vampire wasting electricity and taxpayer money. See and hear the humming kiosk with this link. 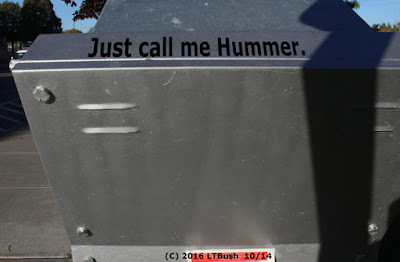 How many more useless hums will be bought with the $10 million grant awarded to the city?